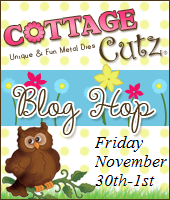 Hello everyone and Welcome to CottageCutz Christmas Blog Hop for November! We are super excited to share with you some Wonderful Christmas Inspiration and Awesome Prizes with you all!!! Be sure to grab your favorite drink and enjoy the Hop!!! You will be entered to Win one of the PRIZES below :) AWESOME right???!!!!! Joanne has offered these super SWEET Gift Certificats to 2 lucky winners, she is super SWEET!! Thank you Joanne!! What is your Favorite CottageCutz Die from the CottageCutz "Christmas Traditions" Release? Thank you all so very much!!! The Winners will be posted on Sunday December 2nd :) so be sure to check back to see all WINNERS then!!! ***Also PLEASE come back on Monday December 3rd, we will be announcing our NEWEST members to JOIN the CottageCutz Design Team!!! Great hop. Lots of inspiration. I love the snowman die. Such a fun hop!!! I loved the Mistletoe & Holly die, so very pretty! Great job by the designers! So many fabulous dies! I love the elegance of the reindeer, but think I would have to go with the snowman, because he is so versatile and cute to put together! Great hop! hard choice to makebut i believe that santa is my favorite. I would have to say that the snowman die is my favorite. the snowman and the mitten dies are my favorites...with the mittens definitely winning. they are so cute...and there's so much you can do with them! What a fun blog hop. It was nice to see everyone's beautiful projects. As for my favorite die...I love the mittens but I think the reindeer are my favorite! What a great blog hop. Very talented ladies. I love to see how dies are used in different ways. I now have some new dies to add to my want list, hehehe. My favorite die from the Christmas traditions release is the Festive Owls. They are so adorable and the first time I saw them they just made me smile! Thanks for the blog hop!!!! My absolute fav is the build-a-pointsettia die. The moment I saw it I just had to have it. When I put it together, it exceeded my expectations--fabulous die. Texture, layers, versatile ... all the things that I love! What a fun experience. I've been waiting patiently to see some new ideas, and I'm impressed. My favorite is the snowman. I've always had a soft spot in my heart for snowmen. What a great hop! I love the jolly snowman! Definitely the merry-moose mas die. I am such a BIG fan of mooses - I bought the die the minute I saw it. But there are lots of other great dies in this group. I love the moose w/all of the lights tangled in his antlers. However my favorite card was the one w/the elegant reindeer. I don't scrapbook, but if I did, I would definitely by copying the wonder layout w/the Santa in the corner. The blog hop was fun! My favorite Chistmas Die that I own is build a poinsettia. Great blog hop. My favorite Cottage Cutz die from Christmas Traditions is the Jolly Snowman. I love him, the dog and the bird are just so cute. I would love to win him. ooh, the snowman...cheery and fun...and playful! So much inspiration. Stunning projects, truly talented team! My favorite die from the traditional Christmas release is the Filigree Reindeer.